On Saturday, February 9th, H.E. 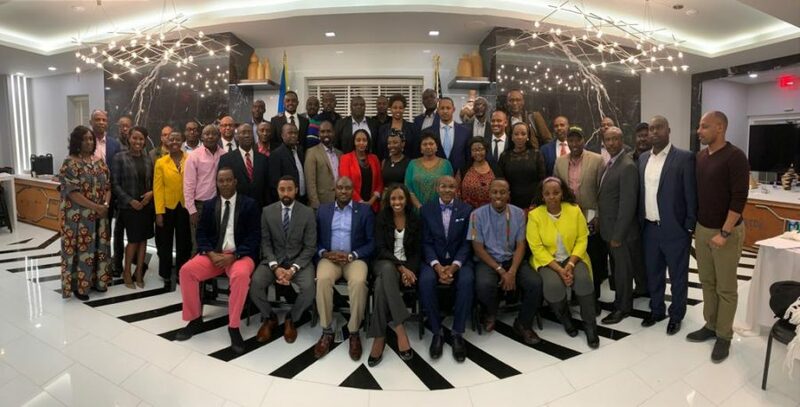 Ambassador Mathilde Mukantabana hosted 37 leaders in various Rwandan communities across the U.S. for a leadership retreat. The meeting was held in Washington, D.C. at the Embassy of Rwanda. In her welcoming remarks, H.E. Ambassador Mukantabana invited those present to use this retreat opportunity as a time to reflect on their accomplishments as community leaders and to examine how they can do better. She also invited them to align their community building programmes with the country’s vision to ensure that Rwandans in the U.S. understand, and contribute to the development of the country. “A few years back, we set our heart and minds to the implementation of Vision2020; we are now at the eve of that target. Our next vision is 2050, and we trust that the diaspora will be a major component in driving the momentum of our development. As an embassy, we look forward to supporting you to the best of our ability in your activities,” said Ambassador Mukantabana. The leaders explored the topics of Engagement of Rwandan youth in diaspora activities, regional dynamics & the role of the diaspora, and economic opportunities. The newly elected team committed to elevating the level of participation in the various communities, and to promote adequate communication in order to foster cohesiveness at the national level. They all pledged to encourage their communities to be great ambassadors of their county and committed to be accountable to their constituency and to be intentional servant leaders. The Leadership retreat takes place every year and is hosted by the Ambassador and serves as an opportunity for the community leaders to look into their performance, goals, and ambitions, as well as explore areas of partnership between the Embassy of Rwanda in the U.S., the individual RCAs across the U.S., and the overall USRCA leadership. © 2019 USRCA All rights reserved.